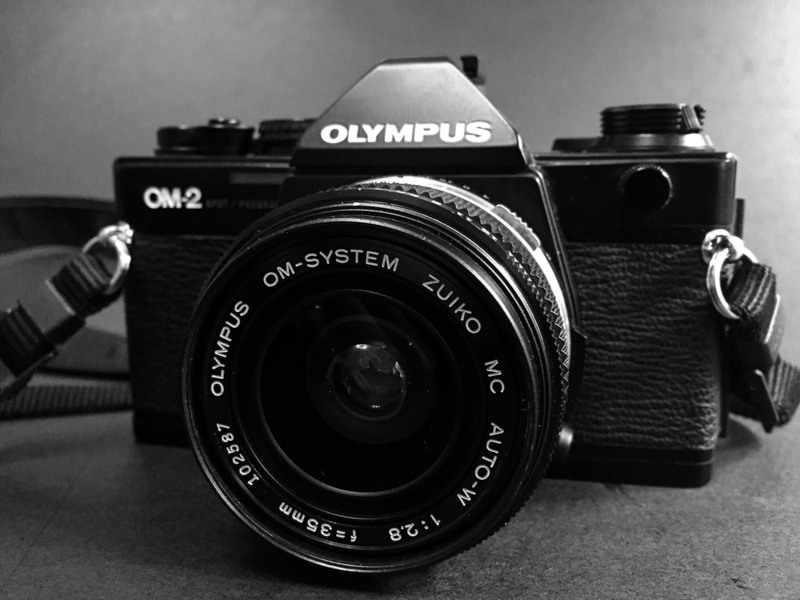 The Olympus OM-1 is thought by many to be the perfect camera. Small, reliable, large viewfinder and equipped with some of the best glass you can buy. What is not to love? Well it is a completely manual camera which takes a little more time to set up to take an image. Olympus had also invented TTL metering where it would actually meter light based on what reflected off the film. This ensured good metering in very difficult lighting conditions. So in 1975, Olympus came out with the OM-2, incorporating the latest in metering technology and aperture priority, however they stuck with what worked and kept the design very similar to the OM-1. The big difference can be seen from the top. On the top we see that we no longer have the simple On/Off switch, we now have something called "Auto". Auto means Aperture priority, which means that you select the aperture you want and the camera will pick the shutter speed. The OM-2 Spot was a significant advancement over the original OM-2 and is more similar to the OM-4 (made from 1984-1988). Where the OM-2 would die without the battery, the Spot was still able to fire at 1/60th of a second. The "Auto" mode in the Spot operates the same was as the original OM-2. In Manual mode, it meters from the central prism area only (about 2% of the field of view) which is where the name came from. When in manual mode, looking though the viewfinder on the left hand side, is an LCD showing you the metering. You can adjust the shutter speed or aperture and the bar grows or shrinks. The idea being to get the bar high enough so that it is in the middle of two arrows. This is simple and easy to use. 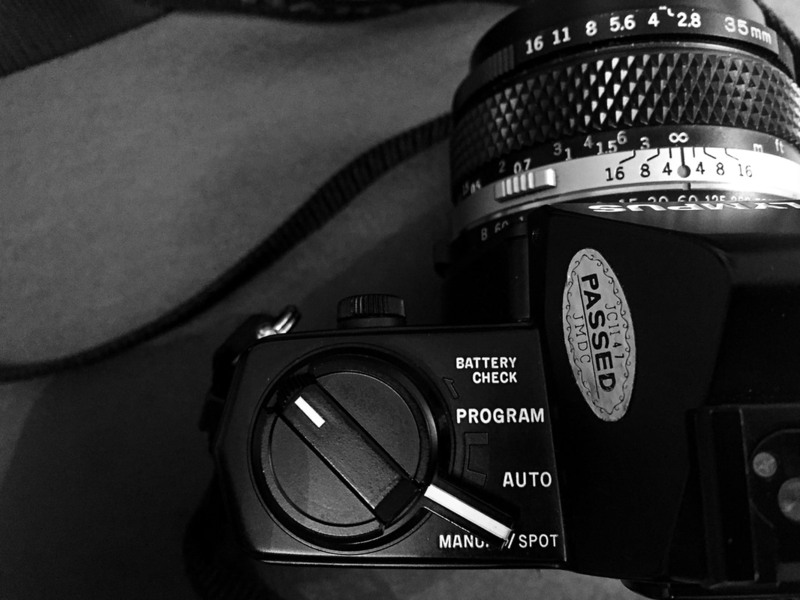 It gives you a bit of the digital feel versus the analog needle that we see on the OM-1. When you switch to the "Auto" mode the LCD changes and you see the shutter speed. As you open up the aperture the faster the shutter speed can go. When you are happy between the depth of field you are after and your ability to handhold the camera at that shutter speed you take the picture. Again simple to use and it stays out of the way of the rest of the viewfinder. The finder itself is large and bright, a complete joy to use just like the OM-1. The camera brings all the wonderful aspects that made the OM-1 such a hit, and brings in new technology to make our life easier. If you want an easy shooting experience the OM-2 gives you that. It is small, very well built and pack full of features. The aperture priority allows you to shoot quicker and the complete compatibility of lenses lets you use the same Olympus glass that made the OM-1 great. 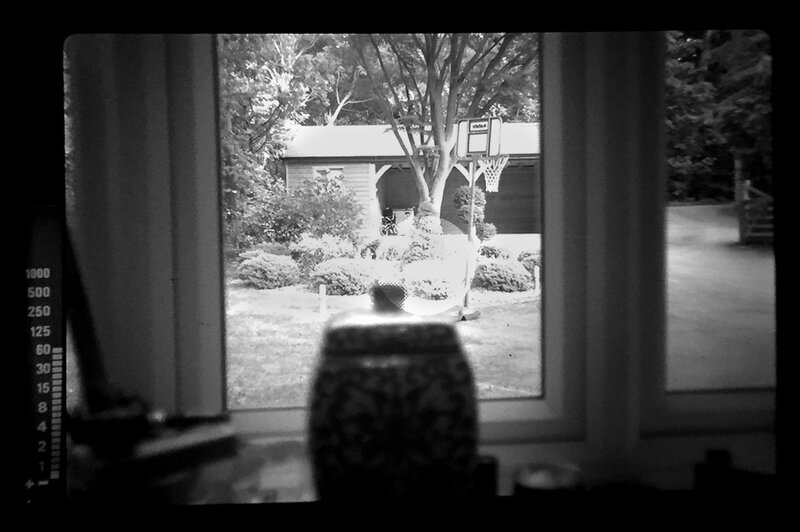 Well what makes the camera wonderful is also what detracts from it. If you want to escape the digital cameras that do all the thinking for you, the OM-2 does not get you there but it gets you close. While it is a reliable camera, I can't help but feel it is a half step below the OM-1. Looking through forums this seems to be the case. The more widgets the camera has, the more complicated the camera becomes. Heck it is a great camera. My OM-1 has great sentimental value while the OM-2 was an eBay purchase. I sent it off for a full CLA and it is now working great. The mechanism may not be as smooth as the OM-1 but its viewfinder is just as bright. If you want a film camera but want aperture priority with excellent glass that won't break the bank this camera is PERFECT for you. If you want the manual control then go with an OM-1, sure the OM-2 has a manual function but it still feels more computerized than the old OM-1. The OM-2 is CHEAP, going for 50-150 GBP for the camera. You can get bundled deals that include a few lenses for a bargain as well. The Olympus lenses are fast and give you great image quality for a very cheap price. Everything feels well built and of good quality. For a video on the OM-2 original please click HERE. For a retro commercial click HERE. For the manual click HERE. I have added two fun videos below. 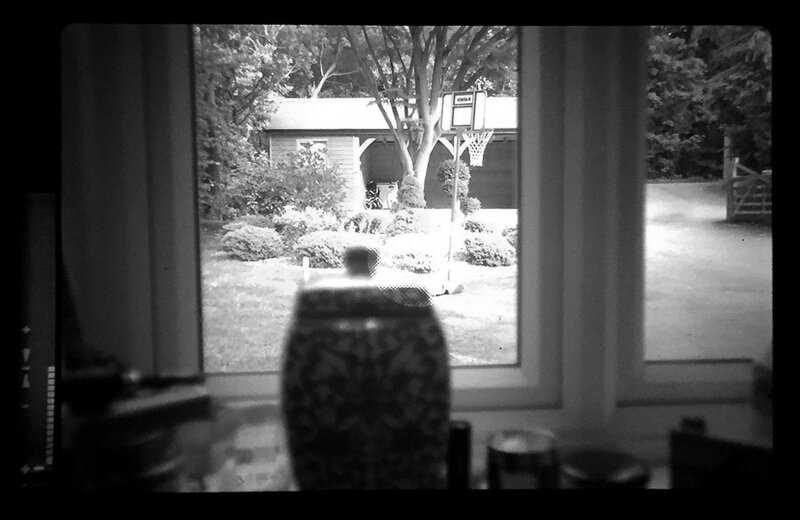 The first is a slow motion shot of the shutter at 1/60th of a second. The video on the right is of the OM-2 on the Winder-1 which automatically rewinds the film after exposure. It will only do one shot at a time so if you want to keep the button pressed to keep shooting you need the Winder-2.